Finally! A bicarb free, palm oil free and aluminium free deodorant that works really well, and lasts all day! I was using crystal magic for the past year after trying half a dozen ‘natural’ deodorants. By natural, I mean aluminium chlorohydrate free. Most people who wear 'natural' deodorant are avoiding this compound that is possibly linked to cancer. I don't care about that though. 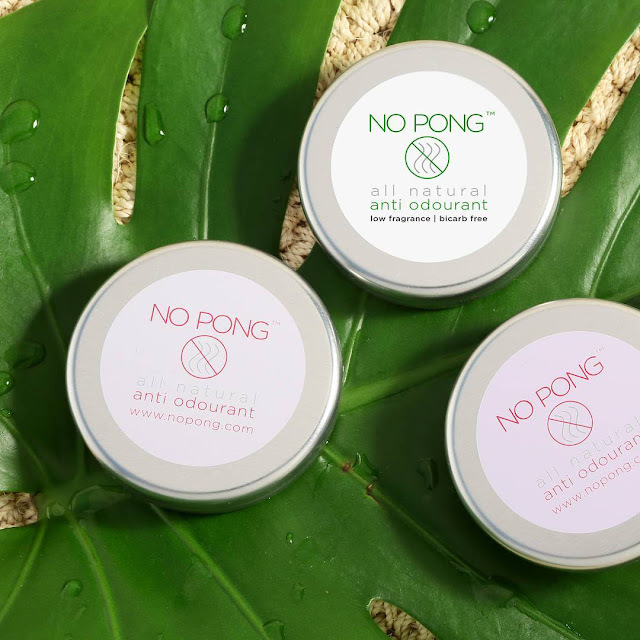 I wanted a palm oil free deodorant because all the roll-ons in the super market contain conflict palm oil derived ingredients, which is killing orang-utans and devastating lands in less fortunate countries. So 'natural' deodorants was my only palm oil free option. Unlucky me though, I am sensitive to bicarb, which is the most common anti-odour replacement for aluminium chlorohydrate - it gives me painful, red and dry rashes. There are bicarb free pastes and roll-ons but the ones I tried only lasted a few hours and I was stinking by lunch time after applying in the morning. So for the past while I've been using crystals but they only fight my stench, they don’t help with my profuse sweating. No Pong came across my Facebook feed as a sponsored ad and at first I was sceptical because advertising. But then I kept seeing real people’s comments raving about their product, so I had a look at the ingredients list. Alas, it had bicarb so I couldn't use it. But then a bicarb free version was developed. Again, I was sceptical because I had tried other bicarb pastes and still ponged but their bicarb version had such mad fans, I decided to give it a go. I am so glad I did - game-changer! No Pong does what its name says. It stops the stink, and also absorbs sweat so you're nice and dry. A tiny pea-sized blob rubbed under each arm lasts all day. It also has the most pleasant and mild scent, which is another thing I didn’t like about other natural deodorants - they all used really strong oils that made smell like an incense stick whenever I raised my arm. I’m now onto my second tub of No Pong already, and have not had a day where I needed to reapply! Though, I should note I do morning exercise then shower before I apply the anti-odourant - I’m not sure how it holds up if you go to the gym after work. I have just started going to Groove Therapy (pre-beginner’s dance class) once a week after work, and that’s fine. I’m not fresh afterwards because so much sweat, but I don’t reek either. Similar to how I felt after adult beginner ballet classes when I was using Dove deodorant roll-ons. Not fresh, but not gross either. What can I say? I’m just a natural stinker. But No Pong helps with that while being bicarb-, aluminium- and palm oil-free! It really is wonderful, and I cannot recommend it enough!